BSARU desperately need a proper Rescue Base in their area. Help Please! BSARU Desperately Need a New Base! 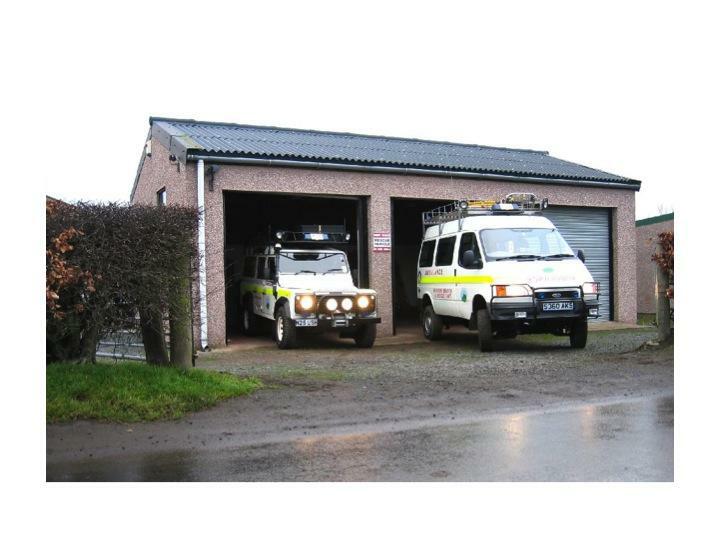 The unit’s team of 26 volunteers currently works out of Kelso police station and the garage at the town’s racecourse that houses its three rescue vehicles. The land that the current garage facility stands on is rented, current lease expires in 4 years and has a 2 month notice clause. We cannot develop the current garage on this basis. Garage does not provide enough space for equipment to be stored in one location. The new Sprinter barely fits! No proper address to receive deliveries of equipment and supplies. The team have been actively searching for a suitable location and/or premises to build or convert to a base for the last 4 years, and have been carefully managing funds raised to build up a reserve to start off the project. No major towns or population concentrations in the team's area of operation - Eastern Borders and East Lothian. Few ambulance/fire/police buildings in this area being released for re-use, which other teams have been able to take advantage of. The Order of St John, who have helped many Mountain Rescue teams to acquire bases, no longer help fund capital projects. Government Funding to Scottish Mountain Rescue does not cover operating costs, therefore team already spend significant time fundraising to make up this shortfall - First aiding at rideouts/offroad events in return for donations, social fundraising events, sponsored walks/challenges, individual team members undergoing sponsored events/challenges. 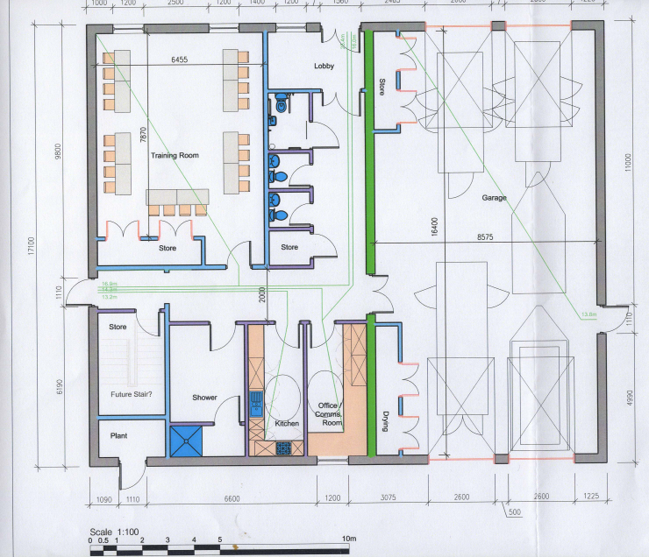 Plans have been drawn up for a proper garage to accomodate all 3 vehicles plus trailer, equipment storage and drying, toilets, kitchen area and training/meeting room. Decent, heated, insulated storage to store, organise and maintain our valuable equipment. Emergency accommodation for team members during prolonged callouts e.g. resilience work, prolonged searches - reducing individual team member travel time and driving risk in poor weather. Ability to involve supporters/ex team members in supporting the team by helping to maintain the base, hosting fund raising and awareness raising activities. 31/1/19: Change of Use Application for Planning Permission submitted. Site identified at Kelso's Pinnaclehill Estate. Generous Legacy donation from a lady in Edinburgh of £60,000 significantly boosts our fund. Offer Submitted subject to Change of Use Permission being granted. 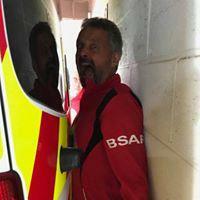 You can donate instantly through our BT Donate page using the 'Donate Now' button above, or if you're holding a sponsored event why not build your own fundraiser page on the BT Donate site and select BSARU as your charity. If you would like to make a donation by cheque to support the Border Search and Rescue Unit please send it to Secretary BSARU, 7 St Germains House, Longniddry, East Lothian, EH32 OPQ. If you are a UK tax payer you may be entitled to 'gift aid' your donation which means that we can claim an extra 28p from the Government for every £1 of your donation. So if you 'gift aid' your a donation of £20 it would actually be worth £25.60 to us and at no extra cost to you! To 'gift aid' your donation complete the form below and send it along with you donation.